Moving Company | Otisville, MI - JGM Machinery Movers & Erectors Inc.
JGM Machinery Movers & Erectors Inc. provides efficient, safe, and protective movement of manufacturing equipment and specialized machinery, such as CNC's and metal stamping machinery. We are also your source for the very latest in chrome plating and coating systems and technologies. Get your quote on any of these services today and discover why we are known for excellence. Call us today for a quote on your next industrial relocation or equipment plating. 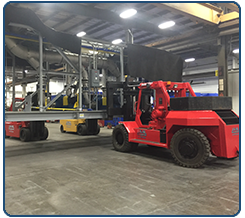 Learn About JGM Machinery Movers & Erectors Inc.
JGM Machinery Movers & Erectors Inc. is an industrial moving company that also provides chrome plating and fabrication in Otisville, Michigan. With more than 30 years of experience in providing industrial relocation services, we specialize in serving the automotive supplier industries. No job is too big or too small, and we can take on anything from a large-scale plant relocation to moving a single piece of machinery. We are also fully insured and licensed, and we can provide a copy of our General Liability Certificate whenever you would like. We have provided our services to many top companies, including Moen™, BMW™, US Army Corps of Engineers, Chicago Faucet Company, Snap On Tools, Delta™ Faucet, Central Kentucky Processing, and many others in the US and internationally. JGM Machinery Movers & Erectors Inc.